Reverb is an essential tool to master in order to create depth and color around a singer, or as Fab likes to call it, "The Sauce". In this tutorial, Fab Dupont explains all of the controls used to tweak the reverb tail and then shows you how to dial in the settings to create the perfect sauce around your vocal track. 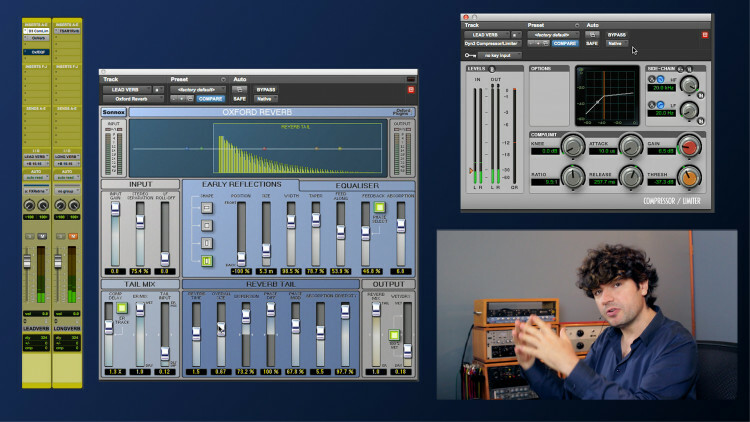 Once you get a feel for the various aspects of a reverb, it will be easier to connect your ears to the final result and achieve the perfect space around your vocal track. Reverb as a "Feature" vs. "Enhancement"
Using compression to control the reverb "bloom"
Good morning children! Today, we're going to learn to cook with sauce! Namely, we're gonna use reverb on vocal tracks so that they sound yummy. You might notice that there's a delay on the track. That's my Haas effect delay, left over from the Delay video. It sounds good, but it sounds dry! Let's add some reverb. What are we looking for? We're looking for the vocal to be surrounded by some sort of ambience that feels good and is not in the way, and enhances the vibe of the vocal. Let me lower the amount of reverb and see if this does it. With the current setting, this reverb has a lot of personality. It's more a feature than an enhancement. What can we do to change that? When you work this way, you want to put the reverb on a separate object, in Pro Tools, on an Aux object, and use a bus to send some of your signal to the reverb. And you want your reverb to be 100% wet, so that what comes out of the reverb object is only reverb, no direct signal. If you ask yourself: why am I not putting the reverb straight on the vocal object, there are several reasons for that. Reason number 1. Most reverb plug-in's blend button reacts funny to level changes. It's very difficult to add a little more reverb while keeping your vocal dry level the same. That's annoying when you're mixing a record. It's always easier to have an Aux, and a bus to it. If you're using other DAWs like Cubase, Studio One, or Logic, the words are a little different, 'Bus', 'Aux', but the system is the same. It's like an old console. You have a main object. From that main object, you have a Send to another object, on which object you have the reverb, and that's just your reverb. And you decide to send more or less of your dry signal to what's gonna be your wet signal. Number 2! I might want to send several stuff to that same reverb to create kind of a close effect, a together effect. Meaning, I might want to send the lead vocal, the lead vocal double, some of the background vocals, maybe I have two different lead vocals, one for the verse, one for the chorus, like in this track, maybe I want to send a kazoo into the vocal track, you never know! It's always easier to do that when you have one object. This comes from old-school limitations where you had one reverb for the whole studio, and you sent everybody into it, and that created a certain sound. And we like that sound, it's been around for a minute! To simplify our lives, what I propose we do is focus on the tail only aspect of the reverb process, the sauce. If you're interested in learning about early reflections, then you should watch the 'Creating Space with Reverbs' video. If you're interested into the delay part of it, then you should watch the 'Using Delays on Vocal Tracks' video. So! The problem with this stuff, it's all the same, plug-in to plug-in, hardware to hardware, but it's all called different things, because nobody got together with nobody to decide about standards. So sometimes, Reverb Time is called Length. Sometimes, Size is called Density, or Reflections, you never know. So let me play you a few settings and tell you what they do, and then you'll be able to translate to whatever reverb plug-ins you're using. The one that's easy is Time. This is a short reverb. This is a long reverb. Here's a midsize reverb with a small room. Notice how it feels a little further away when it's a bigger room. It's trying to imitate a bigger room. There's probably some delays involved in there. I'll play it again. Check it out. Big Size. This parameter you can use to decide how much space there is around the vocal. For example, if the rest of your song is really dry and very claustrophobic, you could probably use a smaller size, and then it'll be easier to blend. However, if you want to freak people out, you could have a huge reverb, big, high ceilings, and a very claustrophobic track. That's a funny effect too! It's a question of taste. What's important is for you to learn to feel what these buttons do, as opposed to think about it, so that you can be inspired when you try to use the plug-in. I'm not gonna bore you with Dispersion, Phase Difference, or Phase Mod, those are old tricks used by the manufacturers, in this case Sonnox, to make this sound more realistic, but we need to learn about Absorption. You've all been in an apartment you haven't moved in yet, you just painted it, it's bright as hell! Then you start adding curtains and rugs and furniture, and the reverb gets shorter, because it gets broken down, but also, the quality of the reverb gets darker and darker as the objects in the room absorb the high end first. That's what this parameter is about. Some plug-ins have this parameter as a low-pass filter, some plug-ins have it as a color filter, some plug-ins have called Absorption, like this one. So now you have your size, then you have your length, and then you have the tone of it, the color of it. You could achieve some of this by EQ'ing the reverb, but this is nice because it's dynamic, frequency dependent, and is really trying to model what a real room would do, with curtains in it, or not. What's important for you to know is whatever reverb plug-in you open will have some sort of a flavor of this, and then other stuff to confuse you. But if you can locate the Time or Length, the Size, or Shape, and the Tone of the reverb buttons, those three buttons will make you happy forever! So let's try and massage this reverb to be complementary to this vocal, in this track. How do you think about it? First, you've got to hear the direct sound and listen to it in the track. Ok, I like the tone of that shorter, brighter reverb, but I think there's too much of it. Now of course, you're gonna ask yourself How do I know there's too much of it? That's a question of taste. Maybe you like this, and that's perfectly fine! This is where what you've been listening to recently, what you've been listening to forever, is gonna influence your choices. All choices are fine as long as they allow you to achieve that final result that you're looking for. If I were making a 1965 Motown style record, this would be way too little reverb. If I were making an angry mid 90s lumberjack shirt kind of vibe record, this would be way too much reverb, it should be totally dry, or a Punk record. It's really a question of taste here. What you need to learn is learn the feeling of the different parameters. How does it feel when the reverb is longer? How does it feel when the reverb is brighter? How does it feel when there's more or less of that reverb longer or brighter? That may seem a little overwhelming, but you get to it pretty quickly. For example, this is where we are right now. And then, this is less of it. The way I like to think of it is when I mute the reverb, I want my center vocal to be the same, but without its friends, and then when I turn it back on, I get the friends back. As opposed to when I mute the vocal, everything goes to hell. So the idea is to add this as sauce. The main ingredient is the same, the reverb is the sauce. Sometimes, even after spending a lot of time comparing different kinds of reverbs, and presets and everything, you can't get the vocal and the reverb and the track to speak to each other, and sit together. It's often faster to just process something that's close enough than to spend more time twiddling presets. So, this reverb has a built-in equalizer. Fantastic! But if your reverb doesn't, you could potentially just add one. So I'm gonna get an EQ. And put it behind the reverb. It never hurts to high pass the bottom when you don't know what's in the bottom of your track, and what's exciting the reverb. It's a nice way to clean stuff. Then you can make it a little darker right here. Listen to the word 'Behind'. Listen how the reverb reacts to the accent in the word 'Behind', and how it makes kind of a bloom in the reverb. You may like that, or you may not. One way to remove that bloom, but keep the reverb the same length and have the same body, is to just low pass it like I just did, check it out. This is without. It's much more even, because that reverb responded quite a lot to that peak on 'Behind'. By EQ'ing the high end out, you get a mellower reverb with less peak. Another way of doing this would be to compress or EQ the Send into the reverb. Now that gets really tricky. Imagine this. Since the reverb reacts pretty dramatically to whatever you send to it, if you make what you send less dramatic, or custom-tailored to just what you want, then you're able to get the reverb to sound exactly the way you want. Let's listen to the Send raw, without reverb, so we can focus on the sound of the Send, with the compression, so we know what the reverb will listen to later when we grow up. To do so, remember, it's always healthy to put your Send in Pre mode, so you can mute the direct signal and focus on the return only. Alright. I'm gonna compress the hell out of it. Super short Attack so all the peaks are taken. Let's raise the Gain, so we can listen at constant gain. It's about right. Then you can turn the reverb back on. So you noticed the difference. Without the compression, the peaks make the reverb algorithm blossom and have that burst in it. It may work for your track, or it may not. Very often, it doesn't work. And you keep switching presets trying to figure out why it's not working. It's not working because your signal into the reverb is very dynamic and it makes your reverb dynamic, which is weird since we want sauce. And I don't eat dynamic sauce! If you compress the reverb Send a little bit, right now we're being a little Attila on it, but if you recompress it a bit, you'll get some of that bloom off, and in the track, it's pretty fantastic. I'm gonna turn the compressor back on, and listen to the track with the reverb Send compressed. You noticed that the combination of the compression and the EQ on the reverb let us tailor the reverb in such a manner that the first tone, the direct tone, is untouched. It's just enhanced by a nice little cotton cloud behind it that's not in the way of the track. If we were to listen to the same exact reverb without the compression, and without the extra EQ, it sounds like this. Without. Without the processing, it has more personality, it's more present, it makes itself heard. With the extra processing, the compression on the Send, and the EQ on the return, you can actually tuck it into the track more. Of course it doesn't stop here. We just compressed the Send to the reverb and EQ'ed the return. But say you have a very thick male vocal in a very thick arrangement, you're gonna want to send that male vocal to a reverb to give it space. Do you want the bottom of the vocal to excite your reverb? Maybe not! So you could EQ the Send to the reverb and high pass the vocal so only the high end of the vocal makes the reverb happy and the bottom end just ignores it. That makes sense. Some reverb have that built-in. The Oxford reverb has an LF Roll-Off, which is really a high-pass filter for the input. So that's built-in. Maybe your reverb doesn't, but you could use an EQ on the way to the reverb to remove whatever frequencies you don't want the reverb to see. Same principle as compression. It's very simple! You basically custom tailor the signal that you want your reverb to see. The reason why I chose the Sonnox reverb as an example is because it doesn't have any reverb types like Room, Hall, or Plate. It has Tail. That's all it does. And you have those parameters. Length, Size, Absorption, which is color. It makes it easy to custom tailor your reverb to your mix. Once you master that, and you get the feel for it inside of you without twiddling knobs, you can get deeper into it and look into early reflections, and the relationships between reverbs and delays. As a reminder, an easy way to think about it is your delays and your early reflections are gonna be your spice, and your reverb tail is gonna be your sauce. You spice it up to give it flavor, and then you put the sauce to make it easy to eat. Great video. On a personal level, though, I'm discouraged that I can't tell the difference between most of these A/B comparisons. @soundspace2001: I only really use the pre setting to show you guys how it sounds or for special effects. When mixing I'm 90% of the time in post mode. Really great video. I just have one big question: do you keep the PRE-button ON all the time - meaning also when mixing? Or do you switch the PRE-button OFF, as soon as you start mixing - or does it make NO difference at all?! I noticed, that you keep it ON all the time and not only for pre-hearing the effects of your editings (I noticed this also in other videos). @FAB, Great video. However do these "principles" also apply when mixing Hip-Hop? I ask because such tracks usually seem awash with reverb. Informative and fun as always. Thanks Fab! Hope the cold's gone. A tes souhaites! Thanks for the video, always a lot to learn. Salut. 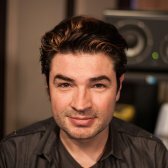 @vgabriel: the idea is to tame the transient peaks so they don;t over excite the reverb engine and it stays more discrete. So pre makes sense. If you want a denser reverb then post makes sense. It'll bring the decay up and make it sound unnatural and present. @hbguitar: Good question. The reverb trio idea works. This works. It all works. In an effort to ease viewers in without overwhelming them with information, we chose to break things down into pieces. You can use the reverb trio only. You can come up with a reverb quartet system for yourself too. You can use the trio and add a bit of the concepts in this video to sweeten the vocal or the kazoo, whichever is your lead instrument. For myself I use the trio and I use these principles to tune them to my liking. If I still feel the track needs something I'll add discrete spaces to the lacking tracks. @DenisD This video is currently in post production! Soon available on pureMix. Where is "Using DELAY on vocals" video? I can't find it. Man Fab, your the best at explaining Audio.. never stop..making video's :) Greets Ravian. I love the cooking analogy. It helps explain so much. Now I don't feel so intimidated when dealing with reverb. Thank you. FINALLY , someone who has explained the use of reverb that has not left me more confused than ever. Fab , thank you , thank you , thank you!!!! !